Salvation Army receives $4,400 through Matching Grants Program! 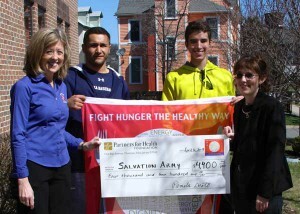 MKA juniors Joe Amato and Ben Rapsas have teamed up with Partners for Health to fight hunger. The young men enlisted more than a dozen peers to join them in a Food Run held on Sunday, April 6, 2014. Each runner/walker raised funds and traversed a 5K route outlined by an MKA Cross Country coach. The course began in Brookdale Park, then went through Montclair and ended at the Salvation Army, which is the recipient of all funds they raised. Partners for Health is matching every dollar donated to support this Food Run. The teens raised $2,200, which means the Salvation Army will receive a check for $4,400. Partners for Health has committed up to $25,000 to this new Matching Grants Program. Healthy food drives will be “matched” at $500 per drive, and fundraising drives will be matched dollar for dollar. All activities must benefit local emergency food programs. “The Fight Hunger the Healthy Way Campaign struck a chord with us because we believe healthy eating should not be a privilege, but should be accessible for all,” said Ben Rapsas. “Ben and I are very active and wanted not only to support healthy eating but also a healthy lifestyle, so we came up with the idea to do a Food Run,” added Joe Amato. Both teens are exemplifying another implicit lesson of the Campaign: that aiding the less fortunate is the cornerstone of community service.